Correct time synchronisation in Time and Attendance systems where people are paid for the hours they work, it is very important that the correct time is usedon the equipment that employees use to register for work. The emotion and bad will created by somebody feeling they have lost a few minutesor been deducted 15 min when the system registered they were late, but the employees watch indicated to the employee they were on time issignificant. By using Atomic Clocks to display and set the time on all equipment used for Time and Attendance, you take away this potentialsource of conflict and unrest with employees clocking on. The company is using the world time standard (The same as the speaking clock), andcan prove that the time on the T&A system is the correct time at all times. All times associated with employee registration show exact correct time. The provable correct time on the Time and Attendance system removes the arguments and conflict around which watch or clock had the correcttime. Helps to combat fraud by providing accurate time-stamping for financial transactions. Automatic adjustment between Summer/Winter Time. No need to remember to change your computers time clock manually. Synchronise computers, Analogue wall clocks, T&A systems, PLCs, test equipment and more to within fractions of a second. Full product range, for all your Time Synchronisation requirements from Galleon The Time Specialists. Automatic update of time. No user intervention required, once installed forget about it. Reliable, GALLEON Atomic Clocks are used by thousands of organisations world-wide. They are used in a wide range of applications, includingcurrency trading and e-commerce. 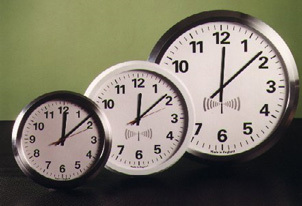 Analogue Wall Clocks, of 15" (380mm) diameter and 22" (550mm) diameter. The Atomic Radio Clocks from galleon show the absolutecorrect time, correcting automatically for Summer and Winter time changes. Digital Wall Clocks, 4" (100mm) high characters displaying hours and minutes. Digital Atomic clocks from Galleon show the absolutecorrect time, correcting automatically for Summer and Winter time changes. Alarm Sounder. Atomic Clock with relay output to drive hooters/alarms for breaks etc. Includes Atomic radio time receiver, relay output,serial interface, time, signal strength and date display. Can be configured for 3 different patterns each pattern triggering the alarm/hooterup to 15 times in a day, and each day being allocated one of the three patterns. Computer Clocks. If you are using a computer based Time and Attendance system then having, and being able to prove you have the correcttime on the computer system and terminals is essential. See the section on Computer Time Servers forthe complete range of products available. Listed below are the products for Time and Attendance supplied by Galleon.